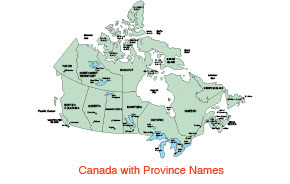 Canada Provinces maps are available in PowerPoint, EPS, & JPG formats. Canadian Province maps are made up of 4 layers; Province outline, major water ways, main highways and major cities. Each layer is grouped together. To change an element, select the layer and ungroup it. All maps are available in editable Powerpoint, editable Adobe Illustrator and JPEG formats. Each PowerPoint file contains a slide with land and text and a slide with just the land, the Illustrator maps are set up in layers.